While I was trying to get that one last kill in a life for a mastery assignment I encountered what I would like to call the "Dark shadow effect" which is the way the game darkens player models in darker areas making them even harder to see. DICE do you realize how hard is to see this thing in a shadowed area? If anything I could see him because he was even darker than the darkness around him and he was moving. Holy, feels like im watching paranormal activity... creepy. Yeah that is why I have turned up my brightness, play on low settings and increased digital vibrance to 75%. It is crazy how the visuals in this game make it difficult to identify targets. Nevermind, watched again and see what you're referencing now. Obviously a ghost soldier easter egg from Scooby Doo. Or a homage to Shadow Mario. that definitely needs some tweeking. I've never seen that in game and it's probably been presented to me hundreds of times by now. That's hilarious... like something out of a horror movie. The developers have wasted so much time, effort and money into making the game look... realistic? But what's the point when everyone (on PC anyway) is likely to turn off every special effect and turn everything down to low/off except the one or two important options such as mesh. You want to be able to see the enemy as easily as possible, so some people go as far to turn their brightness right up, or mess with the monitor colour settings (or via the graphics driver) to get better situational awareness. The game looks terrific with everything pumped to the max, but visibility and framerate are always going to be more important for most players. Personally, I prefer games with semi-realistic or cartoony graphics. Realistic looking environments are great for many game types (RPG's, turned based games, etc...), but shooters need clarity and a high framerate. Just look at DOOM (2016). Lovely graphics, stupidly high framerates (200fps using Vulkan) and superfast gameplay make for a terrific experience, but it's a single player game (so no corner campers or hill humpers to catch you off guard) with easily visible enemies. That was strange, just out of curiosity, are you using the HBOA lighting in your graphic settings? Looks like we are so sleep-deprived, we are experiencing night terrors and the Shadow People have come to stalk us in the game! 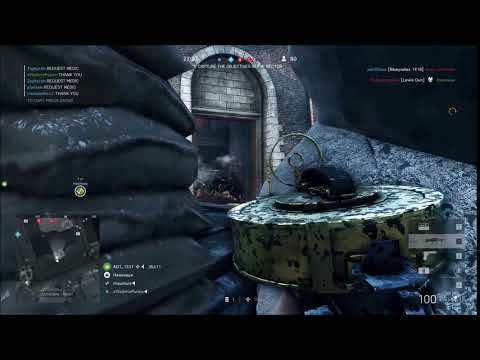 Seriously, I’ve been shot dead by muzzle flashes on floors with no person attached from less than 10m, so I think the BF1 invisibility bug is back with a vengeance. I have my TV on brighter gamma setting and BF brightness up past 60 with TV at fine levels. I still have issues at times. And don't get me started on footsteps. While I don't want footsteps to be weird, I honestly can barely hear some guys sneak up on me when they are running in full gear. Good thing my monitor has Black Stabilizer. Oh, I am not saying it helps. Just wanted to mention.